MINUS SPACE is delighted to present Subvert City, a group exhibition conceived by gallery artist Vincent Como. The exhibition brings together five artists of several generations –- John Beech, Sharon Brant, Vincent Como, Michelle Magot, and Lael Marshall -– who are engaged in varied and distinct forms of painterly heresy. The artists presented in Subvert City honor the modern painting canon by undermining, oversaturating, or inverting it. Employing an apophatic approach to art making, the works by these artists range from the visceral and to the sublime, and stress a unadorned, material objectness. 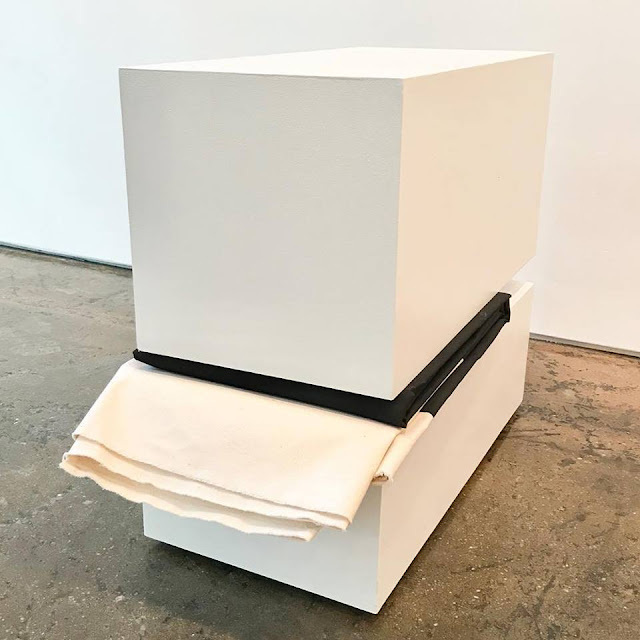 John Beech’s works merge the formal concerns of Minimalism with the common materials and utilitarian objects found in the everyday urban environment, including “discovered” materials, cast offs, garbage bins, and moving dollies. In her work, Sharon Brant applies dense, opaque encaustic paint in black or white around the outer perimeter of beveled oval panels leaving irregular, suggestive patches of wood grain suspended at their centers. Vincent Como’s ongoing work foregrounds a semiotic approach to the color black, and through a wide array of diverse materials, investigates the myriad associations of black as an observable pigment and an absorber of light. Black acts as both a mark of information and an agent of its negation. Working with the properties of matter, color, and irregularity, Michelle Magot’s employs absurd and illogical strategies to investigate the creative act, the unconscious, and non-referential spaces. And finally, Lael Marshall fashions irregularly shaped remnants of wood covered in repurposed fabric, paint, and on occasion cat hair, into humble, diminutive objects that evoke a raw sublime. For further information about the exhibition and available artworks, please contact the gallery. Available artworks can also be viewed on our Artsy page: www.artsy.net/minus-space. John Beech (b. 1964 Winchester, England; lives Brooklyn, NY) has exhibited his work internationally for the past three decades. He has mounted more than 50 solo exhibitions throughout North America, Europe, and Japan since 1989. Recent solo exhibitions and projects include Charlotte Jackson Fine Art (Santa Fe, NM), Anglim Gilbert Gallery (San Francisco, CA), Daniel Marzona (Berlin, Germany), Galerie Les Filles Du Calvaire (Paris, France), Galerie Gisèle Linder (Basel, Switzerland), and Peter Blum (New York), among many others. He is the recipient of awards from the Pollock Krasner Foundation, Chinati Foundation, San Francisco Museum of Modern Art, and University of California. Beech holds a BA from the University of California (Berkeley, CA). Sharon Brant (lives Beacon, NY) has exhibited her work internationally for the past five decades, including in Europe, Australasia, Mexico, and the United States. Brant mounted the well-received solo exhibitions Plenty (2018) and Sideswiped (2012) here at the gallery. She was also included in our recent group exhibitions Brant / Brennan / Zinsser in 2016, and MINUS SPACE en Oaxaca at the Instituto de Artes Gráficas de Oaxaca Alcalá in Oaxaca, Mexico in 2012. 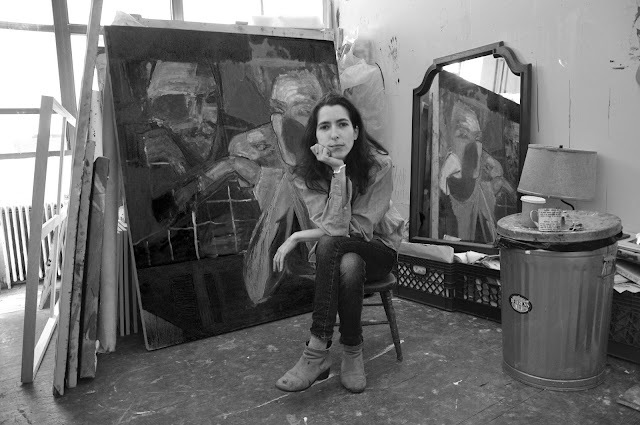 Brant has exhibited her work at museums, including the Whitney Museum of American Art, MoMA PS1, Rochester Museum, Everson Museum of Art, and Aldrich Contemporary Art Museum, among many others. Brant studied at the Kansas City Art Institute (Kansas City, MO) from 1962-1965 and moved permanently to New York City in 1966. Her work was included several years later in the Whitney Museum of American Art’s Painting Annual in 1972. She exhibited regularly with OK Harris (solo exhibitions 1970, 1972), A.I.R. 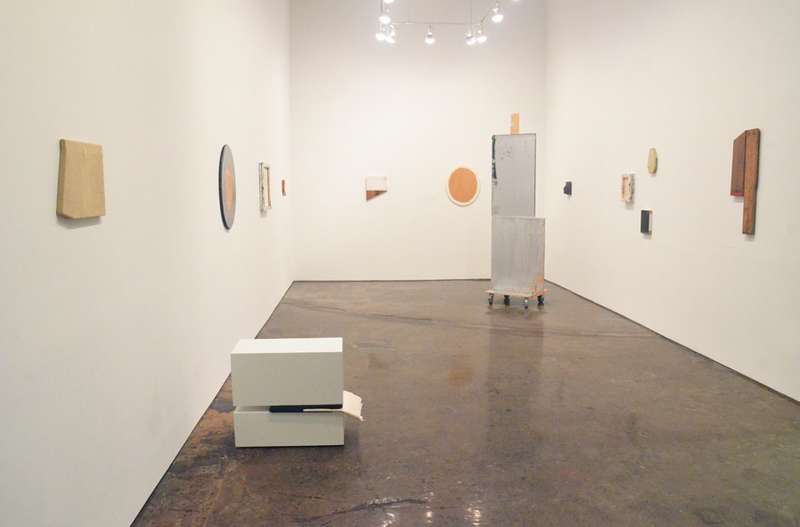 Gallery (solo exhibitions 1989, 1991, 1994, 1996), and Elizabeth Moore Fine Art (solo exhibitions 2007, 2011, 2018). Brant was a member of A.I.R. Gallery from 1989-1996, the first artist-run gallery for women in the United States founded in 1972. She has been a member of American Abstract Artists since 2004. In 2012, Brant was awarded a grant from the Adolph and Esther Gottlieb Foundation. Her work has been reviewed in Artforum, ARTnews, Art International, Arts Magazine, The Brooklyn Rail, Hyperallergic, and The New York Times, among many other publications. Vincent Como (b. 1975, Kittanning, PA; lives Brooklyn, NY) has exhibited his work throughout the United States and abroad, including in Mexico, England, and Vienna. Recent solo exhibitions include Spring/Break Art Show (New York), Reinstitute (Baltimore, MD), and City Ice Arts (Kansas City, MO). Como has also been included in group exhibitions at Key Projects (Long Island City, NY), DEMO Project (Springfield, IL), Pennsylvania State University (State College, PA), Corridor Projects (Dayton, OH), TSA (Brooklyn, NY), Trestle Projects (Brooklyn, NY), Curious Matter (Jersey City, NJ), Art in General, BRIC Rotunda Gallery, Momenta (all New York), Samson Projects (Boston, MA), Illinois State Museum (Lockport, IL), Western Exhibitions, University of Illinois (both Chicago, IL), Evanston Art Center (Evanston, IL), SPACES (Cleveland, OH), Urban Institute for Contemporary Arts (Grand Rapids, MI), Art Museum of the University of Memphis (Memphis, TN), and House Gallery (Salt Lake City, UT), among many others. 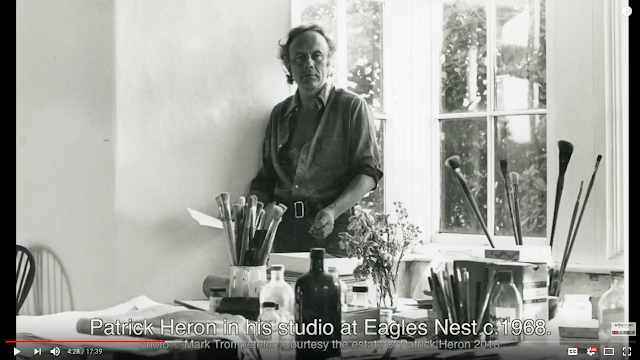 Como’s work has been discussed in publications, such as Art 21 Online Magazine, Two Coats of Paint, The Creator’s Project, New American Paintings, The Wall Street Journal, ArtSlant, Progress Report, WagMag, The Boston Phoenix, Chicago Tribune, Chicago Journal, and Salt Lake Tribune, among others. He holds a BFA in Drawing from the Cleveland Institute of Art (Cleveland, OH). Michelle Magot (b. 1978 Lima, Peru; lives Lima, Peru) holds an MA from the Byam Shaw School of Art / Central Saint Martins College of Arts and Design (London, UK) and a BFA from the Escuela Superior de Arte Corriente Alterna (Lima, Peru). She has mounted numerous solo exhibitions at Galeria Forum (Lima) and was presented in important group exhibitions in Miami, London, Hamburg, and Berlin. Between 1998-2003, she has participated in several residencies in Tuscany, Italy under the direction of artists Rose Shakinovsky and Claire Gavronsky. Magot has taught at the Corriente Alterna Escuela de Artes Visuales and worked in scenery and costumes for productions at the Teatro la Plaza ISIL in Lima. Lael Marshall (b. 1968, Seattle, WA; lives Ridgewood, Queens) holds an MFA from the Academy of Fine Arts (Munich, Germany) and a BFA from the University of Michigan (Ann Arbor, MI). Her recent solo and two-person exhibitions include Gray Contemporary (Houston, TX), 57W57Arts (New York), Dieu Donné (New York), and Mitart Gallery (Basel, Switzerland). Recent group exhibitions include Anita Rogers Gallery (New York), Triennale Grenchen (Grenchen, Switzerland), BRIC, Schema Projects , Parallel Art Space (all Brooklyn, NY), ParisCONCRET (Paris, France), Sydney Non-Objective (Sydney, Australia), Beers Contemporary (London, UK), A/B/Contemporary (Zurich, Switzerland), A3 Gallery (Moscow, Russia), Look&Listen (Saint-Chamas, France), Riverside Art Museum (Riverside, CA), Visual Arts Center of New Jersey (Summit, NJ), and Moulins de Villancourt (Pont de Claix, France). In 2014, Marshall received the Acker Award for Visual Arts (San Francisco, CA) and participated in a Workspace Residency at Dieu Donné (New York).